This guide shows you how to output text to the terminal window using the Linux echo command. 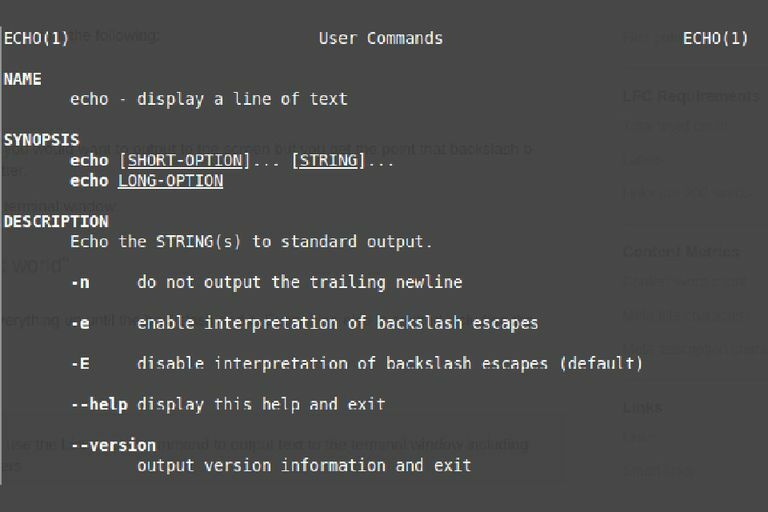 Used on its own in the terminal the echo command isn't particularly useful but when used as part of the script it can be used to display instructions, errors, and notifications. The above command outputs the words "hello world" to the screen (minus the quotation marks). By default, the echo statement outputs a new line character at the end of the string. echo "hello world" && echo "goodbye world"
echo -n "hello world " && echo -n "goodbye world"
Another thing to think about when using the echo statement is how it handles special characters. echo -e "hello world\r\ngoodbye world"
Which special characters are handled using the -e switch? Obviously not really what you would want to output to the screen but you get the point that backslash b removes the preceding letter. This command outputs everything up until the backslash and c. Everything else is omitted including the new line. So what is the difference between a new line character and a carriage return? The new line character moves the cursor down to the next line whereas the carriage return moves the cursor back to the left side. The word hello was displayed, the carriage return took the cursor to the beginning of the line and the word world was displayed. In reality using many people still use the \r\n notation when outputting to a new line. Quite often, however, you can get away with just a \n.